It seems that I have made a few soups recently and I suppose with the colder weather it fits. I have been seeing local cauliflower at the farmers market for a while now and I kept meaning to pick some up but I could not think of anything to do with it. I recently remembered that my mom used to make a really nice cauliflower and cheddar cheese soup and I though that would be a good start to using cauliflower. The cauliflower soup that my mom made was always really orange and I tend to think of it more as a cheese soup. I wanted this soup to make me think more of the cauliflower than the cheese so I went with a white cheddar cheese so that the soup would keep the white colour of the cauliflower. Since I started blogging I have been using more and more herbs. It has gotten to the point where I sometimes find myself thinking that a dish is not complete without an herb. Dill is one of my favorite herbs and I really like the combination of cheddar cheese and dill so I decided to add some dill to the soup. The soup was pretty good! The soup was nice and cheesy and dilly. I left the soup a bit thicker than most soups so that I would get more of the texture of the cauliflower. Note: Use a really sharp cheese so that you do not have to use a lot of it. Add the Cheddar cheese a bit at a time until you get it to where you want it. Add the chicken stock, milk, potato and cauliflower and bring to a boil. Cover and simmer until the cauliflower is tender, about 30 minutes. Remove from the heat and use an immersion blender to puree the soup. Add the dill and stir. Kevin, that sounds delicious and looks just beautiful with the dill garnish. Very nice. Cauliflower and cheese, a match made in heaven. I wonder how this would taste with Gruyere (got some in the fridge). Will have to try it. Thanks for the inspiration! Sounds lovely this soup! you know i have a husband that hates veggies..so it is always a challenge for me to find recipes that will make him eat veggies..this soup of cauliflower will definitely on our menu this weekend! Nice soup, quite comforting for this time of year. As Ferdzy said, cauliflower & cheese are a perfect match. Dill?! How intersting! It’s an herb I really don’t use often enough in winter. And the soup is lovely. No white cheddar for me though…but I see what you mean about a small amount of something sharp. It’s definitely soup weather here! This sounds like a nice combination, Kevin. Cauliflower certainly benefits from the dill. It’s great to see soups appearing all over the place! 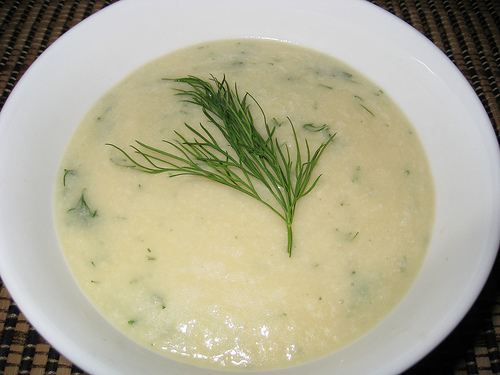 Kevin, the idea of white cheddar and cauliflower sounds great in this soup! I’m a huge cauliflower fan, and it’s such a great balance with the rich cheese, yum! Hi Keven, it’s tricky to photograph soup but you’ve captured this soup beautifully and elegantly. You are so right — a dish is not complete without some kind of herb!! The soup looks wonderful, the picture really conveys it well. Great soup! I never know what to do with cauliflower..kids loved it (18 months and 4) with crusty bread. I added some ham into their bowls(and left out dill on theirs) and it was a hit! Made this last winter. It rocked –I like all of your recipes so far. without much compromise in flavor, texture etc. I love making soups to freeze and enjoy later …. Anonymous: I am glad that you enjoy it! It freezes well !